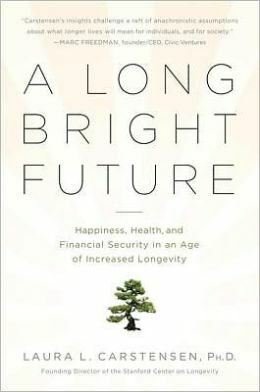 In A Long Bright Future: An Action Plan for a Lifetime of Happiness, Health, and Financial Security, Stanford professor and leading longevity and aging expert Dr. Laura L. Carstensen answers a question many of us may have asked: how can we make the best use of the two or three decades of life that individuals have gained as the human lifespan has increased? Using interviews, research findings and sage advice, Dr. Carstensen challenges boomers (and younger and older adults, as well) to redefine what it means to age in today’s society—essentially to change the way the world ages! It is no surprise given Dr. Carstensen’s years of research in aging populations that she approaches the subject in a compassionate and respectful manner, encouraging readers to embrace the rewards associated with aging (e.g., richness of deepened relationships). Cartensen highlights how living in a “youth obsessed” culture may prevent us from fully appreciating these rewards. Reviewers are lauding the book’s thoughtful approach in blending science and storytelling to present a refreshing view of aging. While the title may imply that the book is meant solely for older adults, the topic is one that readers across the aging spectrum will likely find useful and insightful. It’s a must read for anyone interested in deepening her or his understanding of what it means to age successfully, live well and thrive into one’s older years. Have you read this book? Do you have recommendations for other aging-related books for us to review? Let us know in the comments section below or on our Facebook page.